The yield and the selectivity of reactions in micellar systems are governed by the mass transfer, which can be derived from the results given in figure 1. Here, the reaction rate of the hydroformylation of 1-dodecene is shown as a function of the stirrer speed. With increasing stirrer speed the reaction accelerates. This can be referred to a higher specific interface respectively to an improved mass transfer. Nevertheless, the mass transfer resistance in micellar systems is increased . Furthermore, an additional phase (microemulsion) occurs. To understand the interaction of mass transfer and reaction rate micellar systems important knowledge about the transport processes and interfacial phenomena are missing. 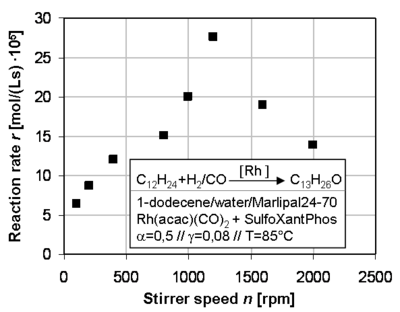 Figure 1: Reaction rate of the hydroformylation of 1-dodecene as a function of the stirrer speed . Gaining a basic physical understanding of the transport processes in micellar three phase systems and pickering emulsions is the main goal of this subproject. Therefore, the phase conditions as well as the interfacial phenomena must be quantified in detail. The investigations concerning the mass transfer shall be carried out at single droplets and in droplet swarms. Furthermore, the interaction between reaction rate and mass transfer will be investigated to design a macro-kinetic model, which is needed to predict reactions in micellar systems and pickering emulsions. Hamerla, T., Paul, N., Kraume, M., Schomäcker, R.: Mass Transfer Phenomena in Micellar Multiphase Systems Investigated for a Hydroformylation Reaction, Chemie Ingenieur Technik 2013, 85, No. 10, 1530-1539. Paul, N.Theoretische und experimentelle Untersuchungen von Transport- und Grenzflächenphänomenen in mizellaren Flüssig/flüssig-Systemen. Technische Universität Berlin, 2014.